Free Radicals are simply molecules in our bodies that have become abnormal. They are counteracted by antio-xidants. The trillions of “cells” in our bodies are made up of billions of molecules, which are carefully designed compounds of sometimes hundreds of atoms. Often, out of several hundred atoms of things like carbon, hydrogen, and oxygen, the most vitally important ingredient in the molecule is three or four tiny atoms of a precious mineral like iron or copper. Healthy molecules have balanced pairs of electrons in their atoms. Through the millions of biochemical reactions going on in our cells all day long, occasionally one of the paired electrons in an atom gets detached. The molecule is then unstable and will “steal” an electron from any nearby molecular atom, creating another unstable “free radical” molecule. The process is like a destructive domino collapse. Discovering the natural remedy to this deterioration is extremely important to everyone. The Root Cause of Chronic Diseases? We CAN prevent this Avalanche. 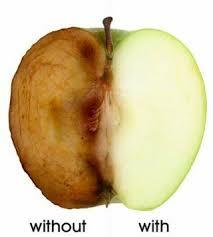 Free radical activity causes “oxidation” in our bodies similar to the rust on that iron and the browning on that apple. This oxidation is at the root of degenerative diseases like cancer, arthritis, heart disease, aging, and about 80 non‑contagious diseases common in our society today. Free radical production occurring naturally is increased by stress, pollution, alcohol, smoke, gasoline fumes, and the fumes of all manner of common modern chemical hazards in the average home. We should eliminate them however we can. If your body doesn’t make them, where can you get them? The naturally created defense system against free radicals includes “anti‑oxidants” like vitamins “C” and “E” plus minerals like selenium, copper and zinc. “Bioflavinoids” found in live plants are vitally important sources for needed anti‑oxidants too. These are only found in natural plants like whole fresh fruits and vegetables. It’s easy to see why many people are suffering such complex diseases when a lifetime of poor dietary habits has literally starved the body of vital defenses. This is why super-anti-oxidants are such a great discovery.